My grandmother recently celebrated her eighty-third birthday. As a treat, we offered to take her to lunch at her favorite spot. She loves Olive Garden, so naturally, that was where she picked. She called early the morning of, wanted to know when we would be there so she could be ready. I could hear the excitement in her voice and couldn’t help but smile. My grandma has always been down for a good time and some laughs. This was clearly not going to be an exception to the rule. Of all the people I’ve met in my life, my Grandma has been the least judgmental person. Ever. She is always kind, offering a smile and sweet words to anyone. I’ve never heard her raise her voice or be upset, not even with my Grandpa, who is quite an ornery fellow at times. My Grandma was one of my first friends, near the top of a short list of people who know how to really hug. My grandparents lived on Lopez Island for most of my formative years. For those that don’t know, Lopez is a relaxing, calm, almost hippie-like haven full of good souls and sunshine, soft rolling hills and welcoming friends island off the coast of northern Washington state. You can only get there by ferry, where you can drive your automobile onto. Lopez is where I spent nearly every Thanksgiving, Christmas holiday, and spring break. I would have lived there, with them, if I would have been allowed. My grandparents are true gems; absolute angels. My Grandpa gave me my first set of luggage, which I would eagerly pack whenever I was given the green light. Always without hesitation. When I was five, I had gotten sick to the point I needed to be seen by a doctor. I was supposed to go visit Grandma and Grandpa but needed the go-ahead first. My Mom was told I had a touch of heat stroke and was prescribed more fluids. With that said, I was off for my next adventure. Except, I was in for a different kind of fun, you could say, since about two hours after arriving, I started to break out in spots all over. It was chicken pox, friends. And it was RARING to be seen. Being sick is no fun. Unless you happen to win the sick lottery and end up at Grandma’s. I WAS IN HEAVEN! She took the BEST care of me, waited on me hand and foot. Made any meal I asked for, which was almost always pancakes or French toast (which I can’t stand nowadays, probably because no one makes them like Grandma) and played so many games with me, like cribbage, rummy and hearts. That summer is still one of my favorites. When we picked Grandma up for lunch yesterday, she was glowing. Had her makeup on, some lipstick and a vibrant green shirt to match her energy. She was genuinely happy to see us. After we hugged Grandpa and promised to have her home safe before long, we set out on our date. Once we got to OG, we sat and jumped right back into our conversation that had started in the car. Chatting and spending time with my Grandma is one of my absolute favorite things in the world, and it was needed. I shared my thoughts on this being my half-ways point in life, what with my upcoming thirty-fifth birthday. She laughed and said she thought that was a fun idea, a good idea. “You never know,” she said and she’s right. I, of course, asked her what her best piece of advice is for life, because I wanted to ask my friend when I saw her in hospice the other day, but couldn’t because she was sleeping and never woke back up. Grandma isn’t dying but I don’t want to miss my chance. I want everyone’s advice. I don’t want time to work against me anymore. I want to ask all the people, especially those close to me. Her answer made us all laugh out loud, but rang with so much truth. “My Mom shared this with me once,” she began. Ohhhhhhhhmaaaaaagooooooodneeesssss, did we have a fantastic chuckle over that. It’s such a friggin truth bomb, though! I asked her so many questions yesterday, trying to remember every moment. None will stick out as much as that one. 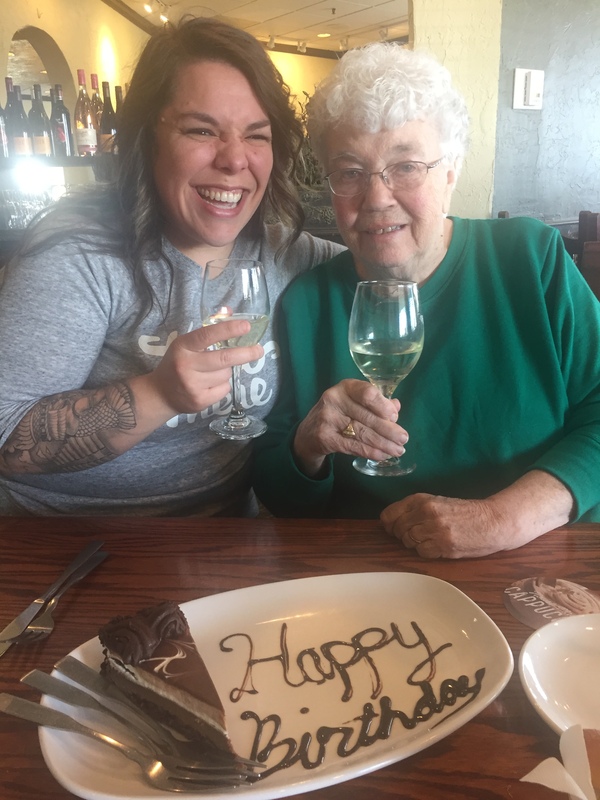 What we thought would be lunch with Grandma became life lessons, how to day drink a bottle (or two) of white wine, marriage tips, and raising kids. We learned about her Mom and all her ever knowing wisdom, taught Grandma about Snapchat, took hilarious photos. We made memories with her that I wouldn’t trade for anything. Life is so short but can be as sweet and loving as you let it. Give people an opportunity to speak openly with you. Spend time with them and ask questions and don’t wait until it’s too late. We all just want to be heard and feel loved and all of us have that power in our hands. Happy birthday, Grandma! I hope I get more years with you by my side!